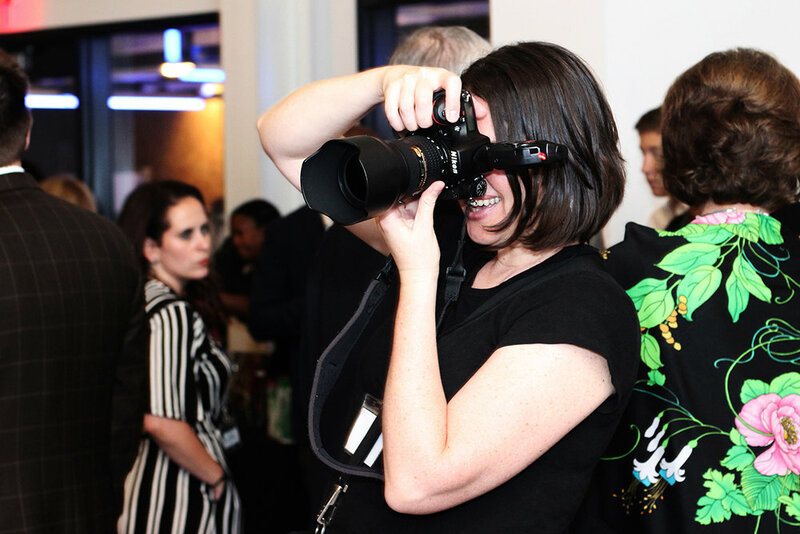 On Saturday, September 22nd, 2018: photographers, filmmakers, illustrators and stylists joined together for the 2nd annual Photo Shoot for a Cure party at District Hall in Boston. The evening raised over $54,000 for The Michael J. Fox Foundation for Parkinson's Research—topping $100,000 to date since it's launch in 2016. Photo Shoot for a Cure is produced by advertising and editorial photographer Diana Levine, in support of her Mom, who was diagnosed with Young Onset Parkinson's disease 14 years ago. Diana has photographed notable personalities like Alicia Keys, Kim Kardashian, President Clinton, New Kids on the Block, Ed Sheeran, and John Legend. Her clients include Rolling Stone, Billboard, MTV, Spotify, and Converse. 2018 Photo Shoot for a Cure volunteers: Top Row, Left to Right: Erika Fernandes, Dr. Heather Wallace Kang, Debbie Barron, Dave Green, Dr. Kara Smith, Marissa Robinson, Alaina Pleatman, Soo Jin Yoo, Sarah Bastille, Diana Levine, Victoria DiBiaso, Teri Boardman, Peter DiBiaso, Jane Runge, Lindsay Scarcella, Sarah Clark, Julie Lauritsen, Brian Lauritsen, Izabel Fernandes, Alex Cruzvergara. Bottom row: Axi Walker, Janelle Leroux, Dr. Angela Messmer-Blust, William Mann, Erin Keaveney, Jenn Keaveney, Jess Aker Archer, and Christina Cobb. Photo by Julie Lauritsen. 2018 Photo Shoot for a Cure photographers: Erika Fernandes, Dr. Heather Wallace Kang, Dr. Angela Messmer-Blust, Dave Green, William Mann, Janelle Leroux, Sarah Bastille, Diana Levine, Brian Lauritsen, Christina Cobb, Alex Cruzvergara, and Chris Valites. Photo by Julie Lauritsen. Photo Shoot for a Cure volunteers with Cindy Bittker, the inspiration behind the event. Left to Right: Debbie Barron, Lindsay Scarcella, Julie Lauritsen, Jenn Keaveney, Cindy Bittker, Diana Levine, Erin Keaveney, Marissa Robinson, Dr. Kara Smith, and Teri Volante Boardman. Photo by Julie Lauritsen. Abby Bielagus from Boston Magazine with Greta Thomas, John Stoddard, Adam Connito, Kellen Zakula. Photo by Natasha Mustache. Aisha Yasin from The TJX Companies runs a Styling Booth for the 2018 Photo Shoot for a Cure guests. Photo by Brian Lauritsen. Nick Emmons (Anchor for NBC10 Boston & NECN), Paige Yatabe and their son Cason. Photo by Will Mann. Christine Trembly, Stephanie Trembly, Shannon Sullivan from Polished Nail Boutique, Brooke Catino, and Lucinda Catino from Polished Nail Boutique. Photo by Angela Messmer-Blust. Guests at the 2018 Photo Shoot for a Cure listen to speeches from Diana Levine, Dr. Sam Frank from Beth Israel Deaconess Medical Center, Samantha Hack from Sunovion, Tierney Saccavino from Acorda Therapeutics, and Axi Wechter from The Michael J. Fox Foundation. Photo by Natasha Moustache. Wedding and commercial photographer Sarah Bastille takes portraits at her photo booth. Photo by Brian Lauritsen. Guests mingle at the 2018 Photo Shoot for a Cure. Photo by Brian Lauritsen. Lisa Sands, Lynn Greer, Anna Salpeter, illustrator and designer Victoria Bornstein, and Jod.i Bornstein. Photo by Will Mann. 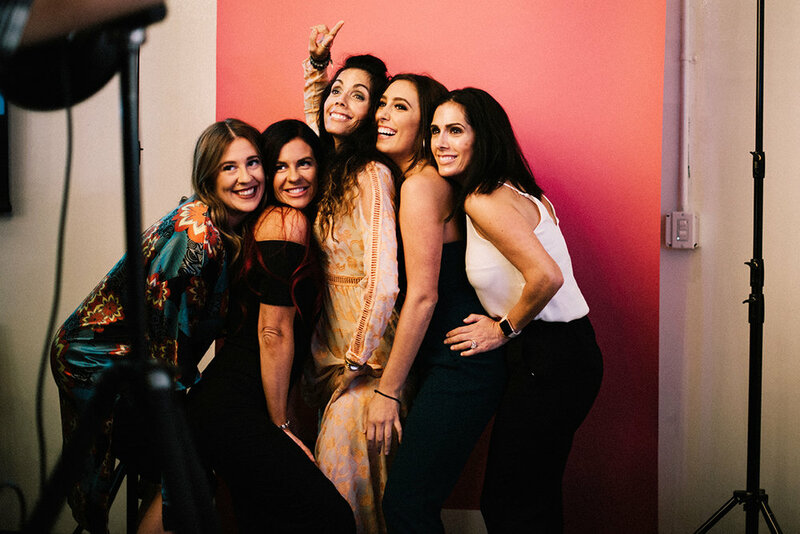 Guests mingle near the photo booths at the 2018 Photo Shoot for a Cure. Photo by Brian Lauritsen. Shawn Rosier, Raymond Tejeda, and Winnie Chen from Capital One Seaport. Photo by Diana Levine. Guests wait for the speeches to begin at the 2018 Photo Shoot for a Cure. Photo by Brian Lauritsen. Host Diana Levine and Alysha Webb, video producer for ELLE.com. Photo by Julie Lauritsen. Sarb Shergill, Jennifer Hunt, Victoria and Peter DiBiaso. Photo by Will Mann. The hairstyling team from James Joseph Salon: Alyse Driskill, Denise Lavino, Rosa Diaz, Mary Chheng, Selina Sigaran, Davina Sicari, and Deborah Rivers. Photo by Natasha Moustache. Donna and Mike Rajkovic from Team Fox Detroit. Photo by Will Mann. Host Diana Levine and her Mom, Cindy Bittker. Photo by Julie Lauritsen. Photo by East Broad Media. Portrait Illustrator Victoria Bornstein. Photo by East Broad Media.